Yesterday I celebrated my 69th birthday. Several hundred friends sent me birthday greetings on Facebook and a bunch of folks texted or called. I enjoyed FaceTime connections with all but one of the grands and gifts from the family and several friends. I also got a great word from the Scriptures when God reminded me of all of the blessings of my life. Just as I thank God for my mother and father who brought me into this world, I am grateful for the day I was born again and my new life began. I am blessed because of Jesus. The older I get the more I understand just how amazing grace really is. I am convinced that we "seasoned" pastors have a wealth of experience from our successes and our failures, so we can be a resource to younger pastors. Likewise the energy, enthusiasm, and creativity of younger pastors can invigorate older pastors. Since God is currently using both younger and older pastors in His Kingdom plans, it's a win-win when the two generations connect. Recently Matt Rogers invited me to be part of a book project which could have significant Kingdom value in connecting younger pastors and "seasoned" pastors. The project was entitled UNITE and the subtitle was "Connecting Generations for Kingdom Expansion". The whole project was crafted to facilitate the connections between younger and older pastors. Each chapter has inspiration and practical help in making these connections. Since I am now one of the older guys, the chapter I wrote is about "seasoned" pastors connecting with younger pastors. I consider this connection to be a matter of stewardship. I believe those of us who have been at this for a while should steward our experiences and learnings to bless future generations of pastors, disciples, and churches. It is a Kingdom thing. In writing one chapter of this book, I hope to inspire both older and younger pastors to consider making the connection for generations yet to come. After 26 years serving as Lead Pastor at Riverbluff Church in North Charleston, I retired in 2014. After 40+ years of discipleship to Jesus, I am more convinced than ever that Jesus is the way to change the world. He literally is The way, The truth, and The life. So my efforts to make disciples aren't exclusively about growing a church, or getting people into heaven, or advancing a career. I genuinely believe it is the way to make the world a better place. I have embraced what I believe to be Jesus' method to change the world. Making disciples has been the foundation of my work as a pastor for over four decades. I can't imagine doing something else because I have reached retirement age. My ministry now is trying to help pastors and churches make disciples. Riverbluff Church has deployed me in my "retirement" to coach pastors and/or churches in how best to make disciples in the current culture. We call it "coaching" because we think pastors and churches want help in being and doing what God has called them to be and do in their specific setting. Coaching begins with the question "How can I help?". As a ministry of Riverbluff Church I now coach pastors and churches. And we consider it a Kingdom investment so there's no charge. While driving to the upstate Saturday, the old hymn "This Is My Father's World" came up on Spotify. I hummed the tune for a bit, but when the music came to the chorus, I loudly sang in my best quasi-operatic voice. (Yes, I was alone in the car!) It was as if I were in some imaginary choir and we had been instructed to sing "full voice'. I was completely oblivious to anyone else driving along the interstate with me. And I felt really good after this musical outburst! That morning in my time alone at start of day, after praying for pastors, my prayers had focused on the current troubles filling the news. There were (and are!) plenty of things for us to pray about. But as I sang that old hymn, The Spirit reminded me of the Heavenly Father who "owned" this world. He prompted me to thank God for the blessings of life. So many blessings came to mind: the air we breathe. Music. Grandchildren. Love. The beach. Water. Strawberries. Friends. Otis Redding. (You can insert your favorite singer here.) If there were a scale to weigh them, the blessings of life would far outweigh the troubles. After naming several people and things in my life, I thanked God for the greatest blessing I have ever received- Jesus. The day I trusted that Jesus did everything necessary to make me right with God was truly a day of personal freedom. It was the day I experienced His Amazing Grace and began to live the Good and Beautiful Life. I think that's why I sang that way that day. Of course, singing an old hymn full voice is not a therapeutic way to divert one's attention to more pleasant thoughts. Neither is it a way to escape from the troubles of the world. Indeed, escaping the troubles of the world is not His strategy for his disciples. Jesus' plan for us is to get smack dab in the middle of the troubles of the world and bring love, prayers, serving, truth, and blessing We overcome evil with good. We're not escape artists, we are change agents. But the hymn that morning reminded me of a beautiful truth: As a disciple of Jesus, I now live in His presence 24/7, and there is nothing that can ever change that. So once again, as I drove to meet some buddies from long, long ago, I decided that I will pray for the people experiencing the troubles of the world. I will act on the promptings of the Holy Spirit to bless others. And I will choose gratitude until it becomes the default attitude of my heart. And sometimes that will move me to sing! So if you see my alone in my car singing as if I'm Andrea Bocelli, don't laugh. Join me. In light of the tragic shooting death of Walter Scott, I believe God is calling HIS people to pray. HE has chosen prayer as HIS channel of blessing and is waiting to answer us and supply our needs. We desperately need God to step into our community and bring HIS healing and HIS peace. Jesus tells HIS followers in Matthew 5:9 “God blesses those who work for peace, for they will be called the children of God. .” Our Father’s plan to bring HIS peace to our neighborhoods and our community is through HIS children and Riverbluff, we are the children of the Living God. Making HIS peace begins with prayer and as Jesus told us, part of praying involves asking God to “lead us not into temptation, but deliver us from evil.” (Matthew 6:13) We need to ask God to deliver us from the evil in this world and from the schemes of our enemy. This morning in our SOAPing through God’s Word together we read Jesus’ Words in John 10:10 “The thief’s purpose is to steal and kill and destroy. My purpose is to give them a rich and satisfying life.” The enemy of God’s Peace will set out to steal, kill, and destroy the peace that God desires. That has already happened in this tragic shooting death. Many families are grieving this morning, experiencing loss and destruction and suffering great pain. The enemy of God and HIS people would like nothing more than to unleash more Hell into our community, but you can make a difference in prayer. Will you humbly seek God in prayer today with a repentant heart that is seeking HIS Holy Face? If we will, HE will! HE will stir up forgiveness and healing in HIS community here in Charleston. -For God Kingdom to come and HIS will to be done in this time of pain in our community. -For the family of Walter Scott to be comforted by the Spirit of the Living God. -For our city leaders Mayor Summey, Police Chief Driggers, all Police Officers in our City, and other City officials carrying a very heavy burden today, that they would be given wisdom and comfort. -For community leaders to be filled with the peace and the love of Christ Jesus. -That God’s people in our community would “do peace”. -For Patrolman Michael Slager and his family. 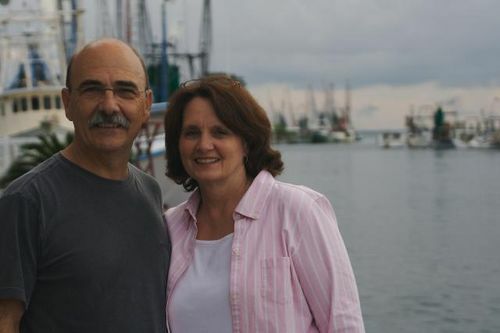 After 26 wonderful years as Lead Pastor of Riverbluff Church in North Charleston, I retired. After three months of retirement, I’ve concluded I have not retired. I have "kinda-sorta-almost-retired" with a new Kingdom assignment. Part of the Riverbluff Church DNA is helping other churches. Sometimes we send speakers. Sometimes we conduct Vacation Bible Schools for other churches. Sometimes we loan equipment. Once a year we cancel our services and worship with other churches giving them our prayers and offerings. Several times we have asked members to serve these other churches for a season to help them get strong. Once we loaned a staff member to The IMB in the Middle East for three months because they had an emergency personnel need. Our Counseling Center serves all Charleston area churches, and often pastors and/or their families. So the idea of a person who helped other churches wasn’t new to Riverbluff. We simply added a bald guy who loves coffee and helping pastors. What do I do? At this point, it’s drinking a lot of Starbucks with pastors. After getting acquainted a bit, I ask “How can I help?” Most of these guys don’t want to be Riverbluff or Curt Bradford, so they don't want mentoring. They would like to get a little counsel from a fellow pastor with no agenda other than Kingdom building. So I try to help according to their agenda. Quite often my role is encourager. Other times I’m the one they “bounce ideas off”. At times I have been simply a “safe person” to talk to. I'm like a coach who helps someone reach the goals God has given. I wasn’t sure how God would connect me with these pastors and/or churches, so I decided to use a unique strategy- I would pray about it and ask God to bring the people He wanted me to work with. And He has. I’m having a ball working with some great guys and great churches! Just thought I would update the three people who read this blog (give my grandchildren a hug, please!) and ask you to pray for the work we’re doing. Thank You Lord for this Kingdom retirement assignment.